Over the years I have accumulated a growing pile of pliers, screwdrivers, wrenches, and other miscellaneous small tools. It long ago outgrew the little toolbox I have, turning into more of a tool pile or perhaps a tool dumping ground. I needed a new, bigger toolbox. 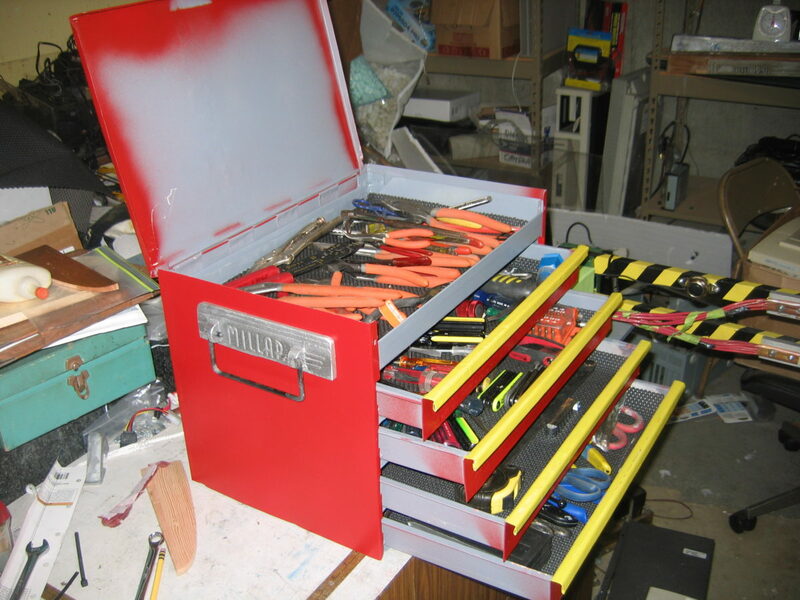 Having recently built some new toys, namely a bending brake and spot welder, I knew I needed to build my own toolbox. Actually, it was the other way around. I had the toolbox idea first. I built the brake and spotwelder because I thought they could help build the toolbox. And they did. I gave myself a challenge on this project, to make the entire toolbox from reused and recycled materials. Not because I’m a cheap bas bargain hunter (I blame my dad’s thrifty Scottish upbringing… Hi Dad! ), but because I’m really one of those eco-hipster tree huggers who wants to save my wallet the planet. I built my own sheetmetal bending brake. I used some scrap angle steel pieces which I welded with my arc welder. Scrap sheet metal is easy for me to find, from PC cases and discarded appliances. But to be useful, you need to be able to bend a nice clean straight line. The base and bending lip were easy to make. I had a little more trouble deciding how to make the press clamp. My short-term solution just bolts straight down from the top. My first project was a small set of drawers.